AMTECH offers -Alluminium Body / Cast Iron/ Cast Steel/ Stainless steel Pinch valves With Rubber Sleeves are extra double heavy with full covering flanges preventing corrosion on body and four reinforced pulling lugs for positive operation. The sleeve is internally completely reinforced located. The sleeve is internally completely reinforced, Which with stand against continuous operation. The sleeve is such designed that it will retain complete roundness in full open position giving full flow of pipe line.Valves are fullway-seatless & glandless, Heavy duty replacable Elastomer sleeve. Four reinforced pulling lugs prevents sleeves from collapse even in vacuum full covered flanges protects from corrosion effects. Can be drilled to DIN, BS 10, IS or any.The Valves are of complete sturdy construction to handle various abrasive & Corrosive Liquide. Pinch valves are used in applications liked Chemicals,Alkaline Mixtures,Acids, Slurries & intermediates, Liquid Foods, Viscous fluids, Sludges, Gramles,Dry Suspension,Powder Collectors,Gases,Pulps,Vacuum,Sewage Plants,Thermal Power Stations Water Containing Ash,Pharmaceuticals – Picklings,Textiles Industry,Mining & Cement Industry,Acid & Chemical Tankers,Refineries,Fertilizers,glass industries and many more process lines. Salient Features : Straight Full Flow. No Liquid hammering,it Can withstand 8 Kg/ cm working pressure,Utility in vacuum upto moderate pressures, Perfect Sealing even on Untrapped solids, Can handle most corrosive and abrasive materials,Built in Flange Gaskets,Only replacable part- rubber sleeve,Split casting ensure quick maintenance of the valve Heavy duty Graded Cast Iron / Alluminium Alloy. 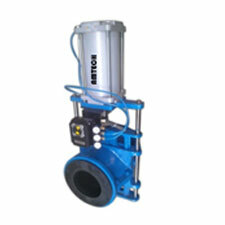 Amtech pinch valve design has three main components: the sleeve, the body and the actuator (manual, pneumatic, hydraulic and electric). The construction and materials of these components can be tailored to suit your process conditions.Size range: standard range from 25 mm to 1.000 mm,Temperatures: -50°C to +160°C,Operating pressures: vacuum to 10 barIn the open position, valves are at full bore with no flow restrictions. During closing, two pinch bars squeeze the sleeve shut on the centerline.